Last night was the Superbowl party. I don’t even like football, but we all go to hang out with friends. But this means we were all up late and ate too much junk food, so this morning it took me ten minutes of gentle touching, shaking, poking, and eventually tickling to wake up my three daughters for school. Needless to say they weren’t impressed. Needless to say, the day started out rough. But I found myself telling my kids, as I so often tell myself: Today is going to be rough, but you will make it through and tomorrow will be better. I came across the above quote just today. I thought it was timely, considering. Sometimes we feel like we’re just hanging on by the skin of our teeth and if we let go, even for a second, everything is going to fall apart. I catch myself thinking like this all the time. And then I find myself telling my kids “it’s not the end of the world”. Did you realize that? Whatever you’re going through today, it’s not the end of the world. It could be awful. It might feel like the world as you know it is over. But it’s not. 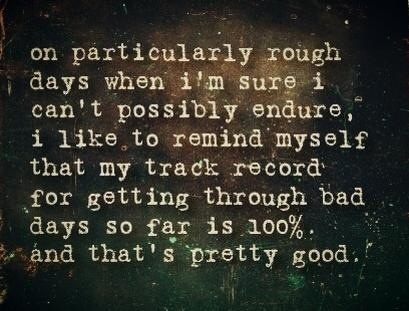 Just remember that 100% track record, and keep pressing on. That’s a fantastic quote! And so true. Sometimes it’s hard to see the light at the end of the tunnel, but it’s important to remember that there always is one there, no matter how long the tunnel might be. Great post! Ah, we weren’t the only ones to suffer a post-superbowl morning then! 🙂 And you guys left way before we did.